As it turned out, her confidence was not misplaced. 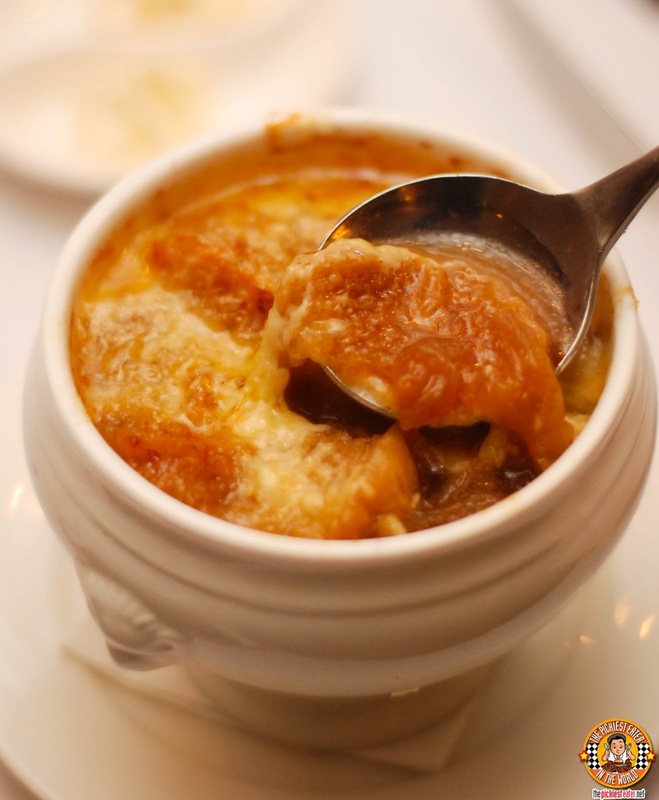 The Onion Gratine (P375) is Nostalgia Lounge's version of the Classic French Onion Soup. Topping the bowl is a thick layer of gooey, Emmental Cheese, which you break through with your spoon to reveal soft onions simmering in a vibrant broth. The thickness of the cheese makes the soup heavier than expected, so have a care when eating it with bread. You don't want to be too stuffed for your main course (trust me). 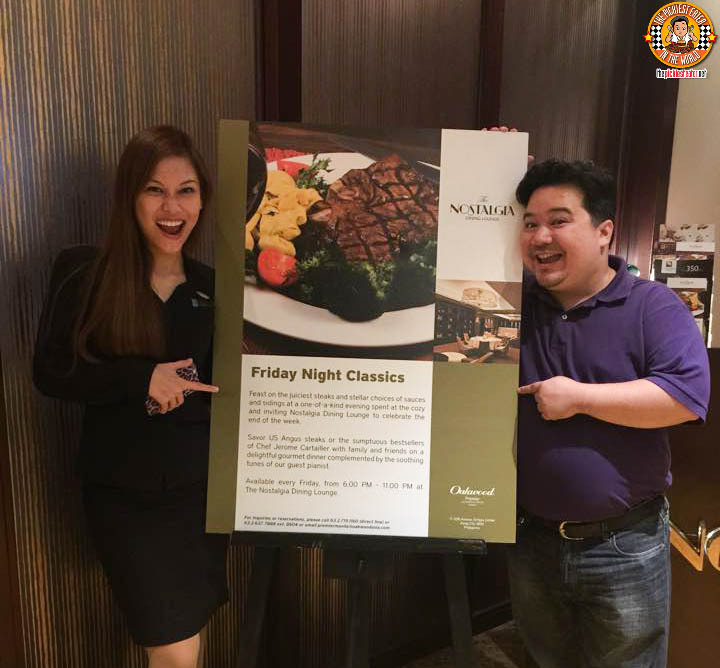 Your Friday Night Classics Dinner continues by selecting your preferred cut of U.S. Angus Steak. 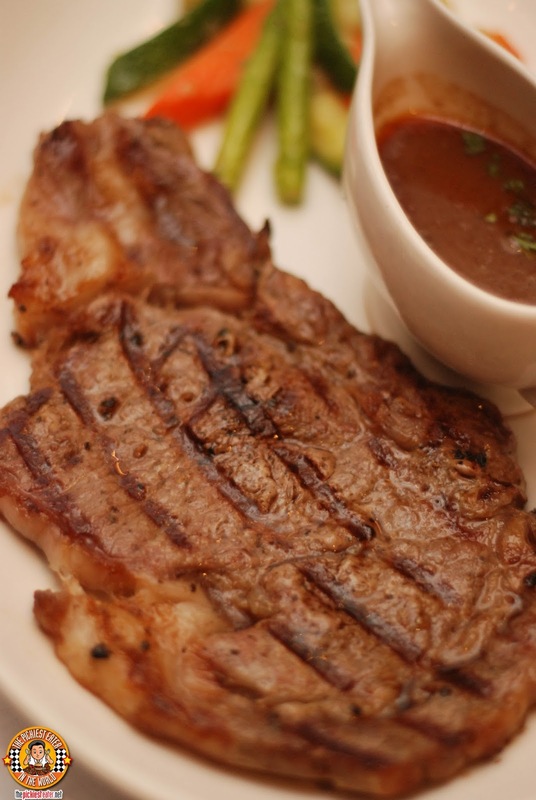 If you like your steak on the leaner side, then you can't go wrong with the U.S. Angus Tenderloin (P2,215 6oz). This is the steak that offers the thickest, meatiest cut, that maintains an exceptional level of juiciness, despite the lack of fat. Admittedly though, this is my least favorite cut (This body demands some fat). 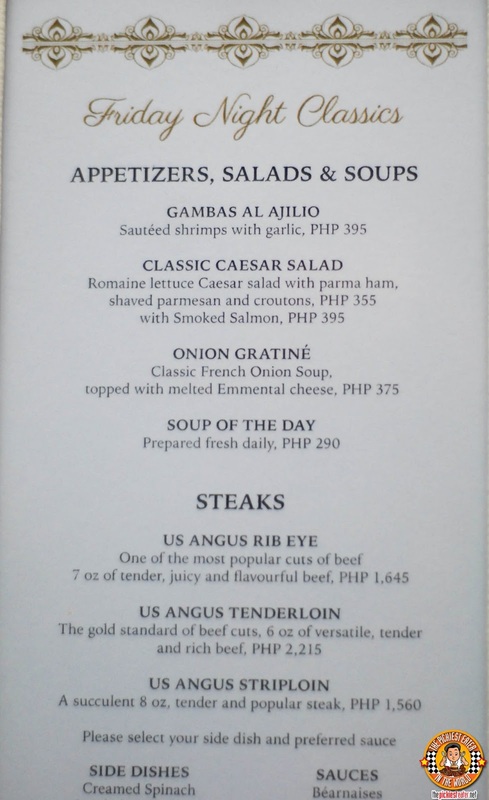 The U.S. Angus Striploin (P1,560 8oz) is a great bang for your buck steak. It's a good balance for those that enjoy their steaks a bit lean, but are looking for a nice lining of fat, without going too overboard. Despite it being the heaviest cut of Steak, it is the most affordable. 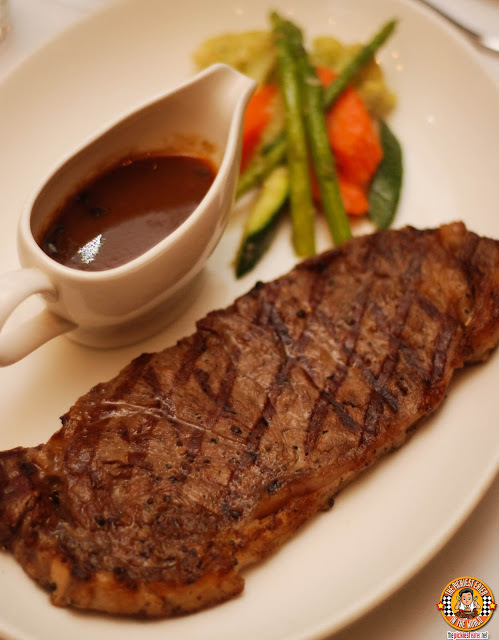 Regardless of what cut of steak you choose, you are guaranteed to get an incredibly tender, moist, and masterfully cooked slice of Angus beef. 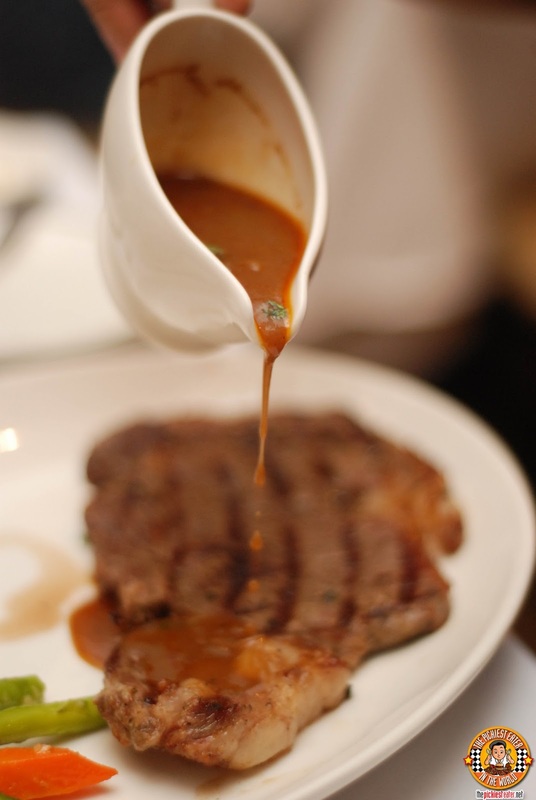 After selecting your Steak, you then choose your sauce in which you will be dousing your steak in. 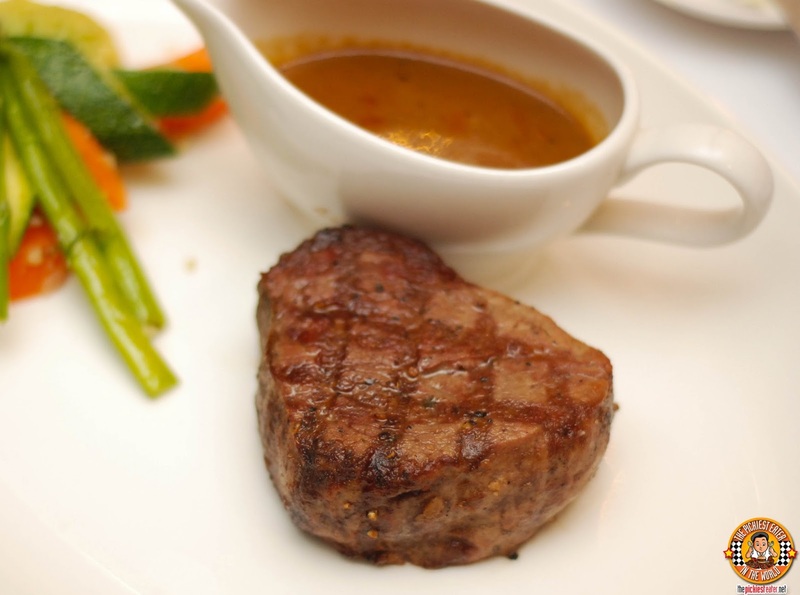 Granted, the natural flavors of the beef can shine on its own, however the sauce adds a distinct dimension to your meal. Your choices range from the classics, such as Merlot Shallots, Bearnaise, & Peppercorn, as well as the more playful, such as Bleu Cheese and Honey Mustard. Once you have your steak and sauce, you choose your side dishes. 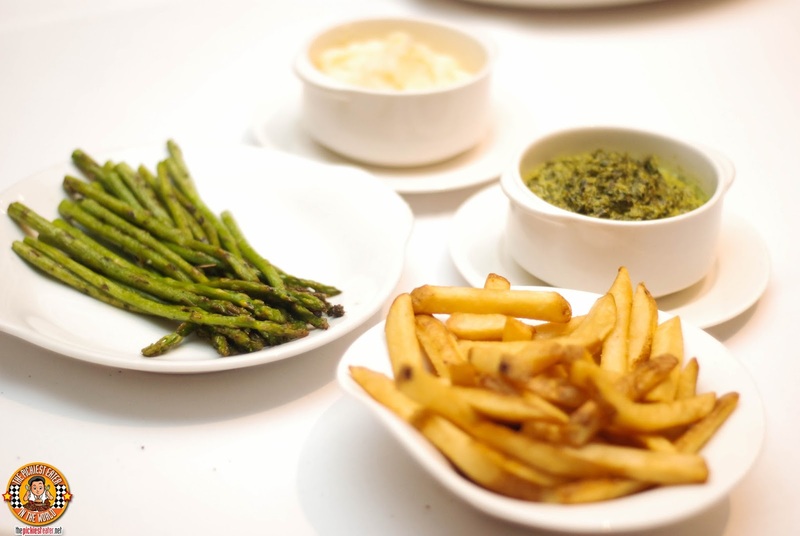 Your choices range from Steamed Asparagus, Mashed Potatoes, French Fries, Sauteed Mushrooms and Creamed Spinach. I highly recommend the silky, soft mashed potatoes, while my lady companions raved about the creamed spinach. 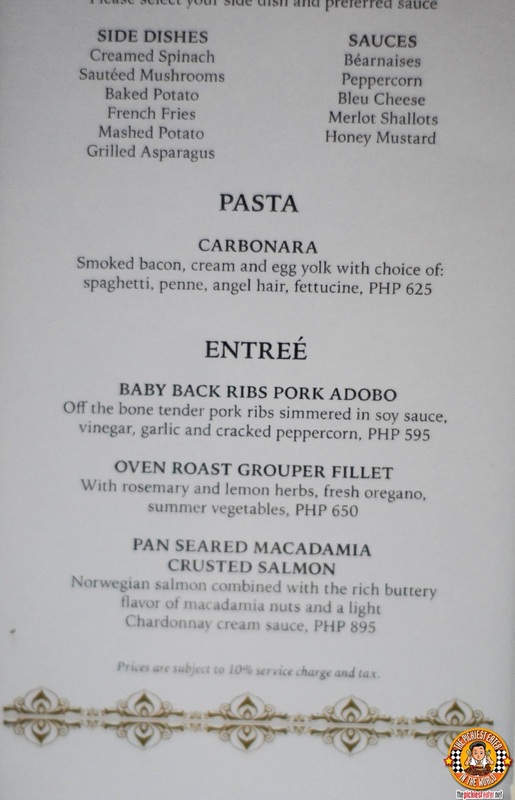 Apart from the Steaks, Nostalgia Lounge's Friday Night Classics also offers some of their specialties, such as the Pasta Carbonara, Baby Back Ribs Pork Adobo, and Pan Seared Macadamia Crusted Salmon. After annihilating your main course, you're going to want to end your evening on a sweet note. Nostalgia Lounge has got your back, with some very delicious dessert items for you to choose from. Nostalgia Lounge boasts of an impressive lineup of delicious flavors from New Zealand Ice Cream (P180). 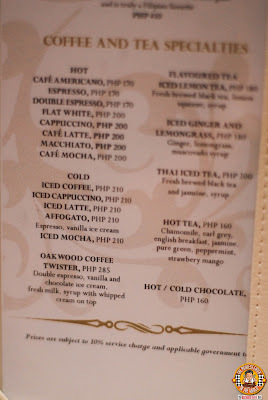 Your selection consists of Affogato, Chocolate Ecstasy, Strawberry Surprise, Macadamia Supreme, Vanilla Classic, Rum Raisin, Super Fruit Sherbet, Caramel Chocolate Crunch. 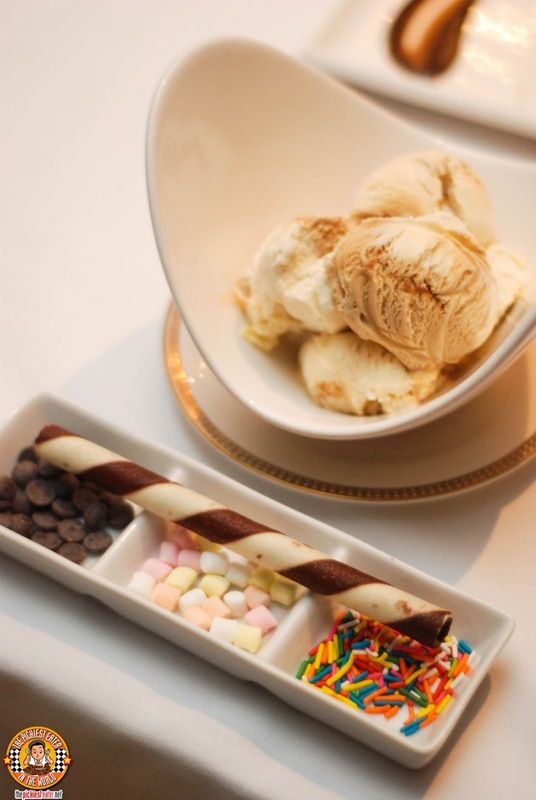 What makes your ice cream experience even more delectable is how Nostalgia Lounge adds a touch of condiments, such as sprinkles, wafer sticks and marshmallows, that allows you to dress up your scoop of ice cream! 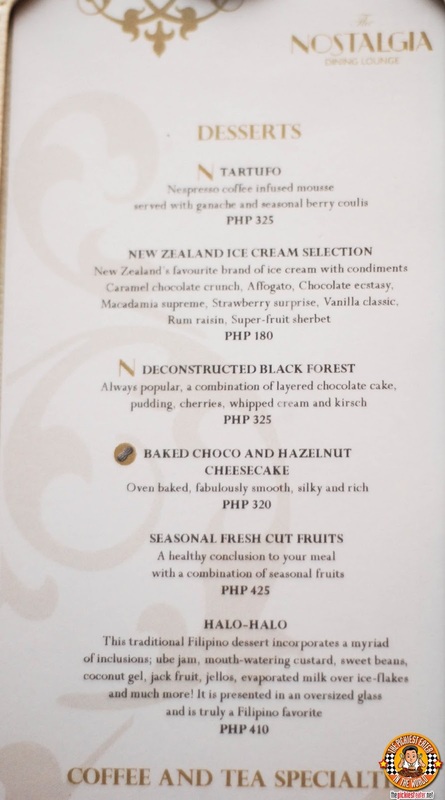 The next dessert we tried was the Tartufo (P325). 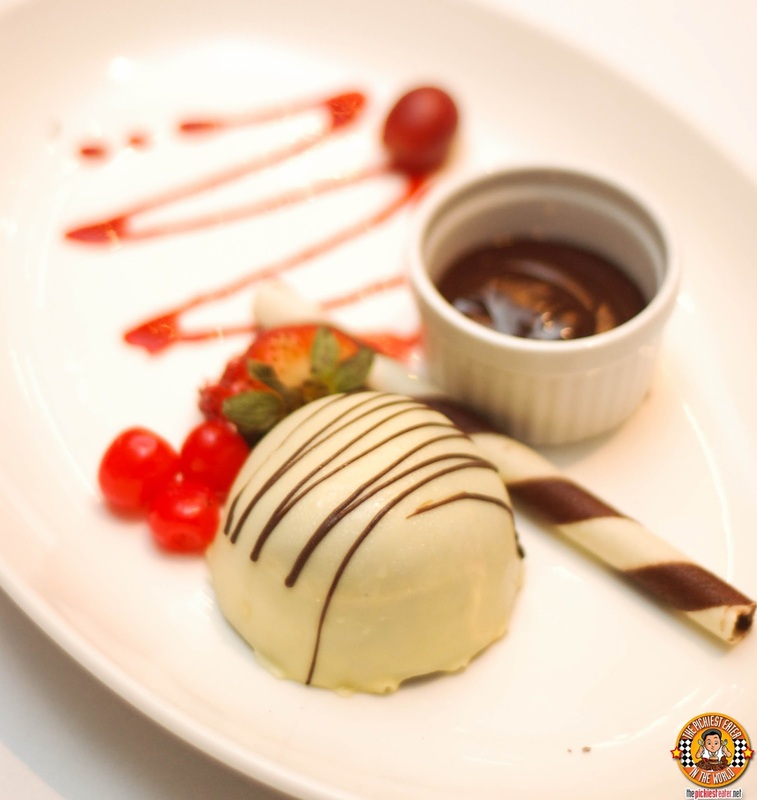 A Nespresso Coffee Infused Mousse, encased in a white chocolate hard shell, and served with cream chocolate Ganache and seasoned berry coulis. I'm not a big fan of coffee based desserts, but this was actually pretty good. 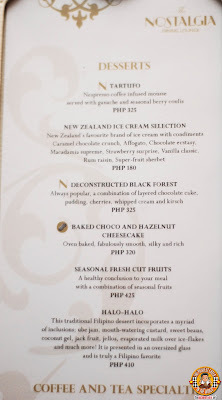 I was quite impressed with the artistic creativity that went into the Deconstructed Black Forest Cake (P325). Not only was it visually stunning, but it was delicious as well. 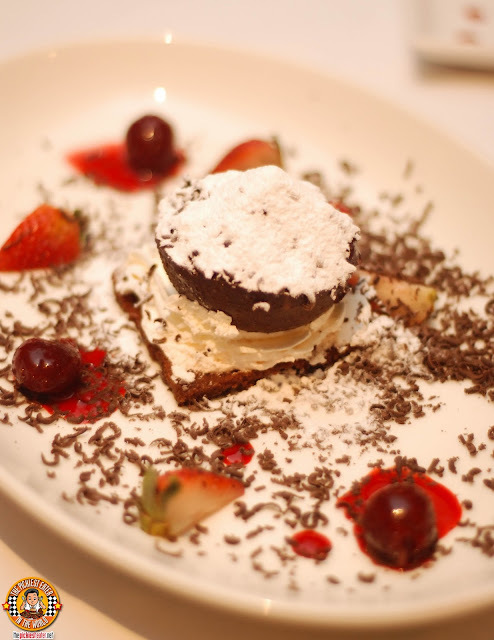 A soft, moist, layered Chocolate Cake, filled with creamy Pudding, and speckled with Cherries and garnished with Whipped Cream, with a dash of Kirsch adding the liqueur flavor that Black Forest is known for. Although we didn't want the night to end, we were excited to cap off our phenomenal meal with the Baked Choco & Hazelnut Cheesecake (P320). 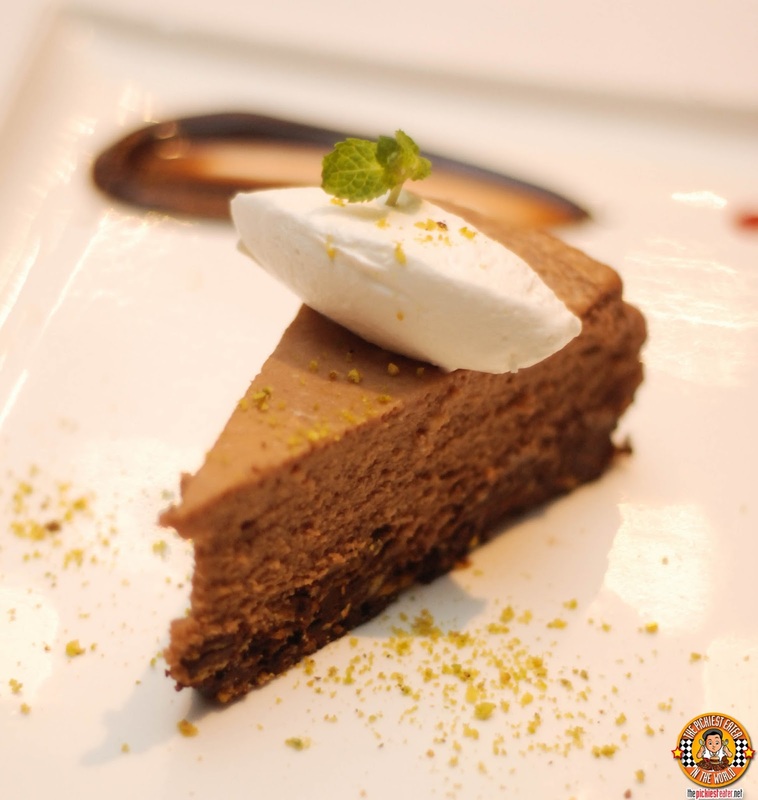 If you're a fan of Nutella (Like 90% of the world hehe), then this delightful cheesecake is for you! 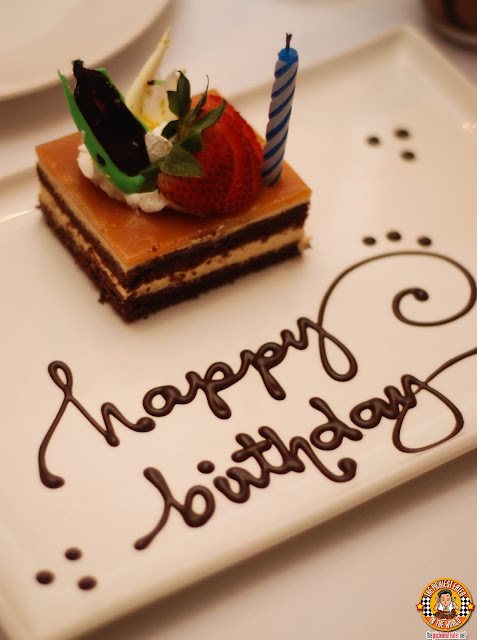 We were taken aback when the Guest Pianist of the evening began playing the opening notes to "Happy Birthday"! 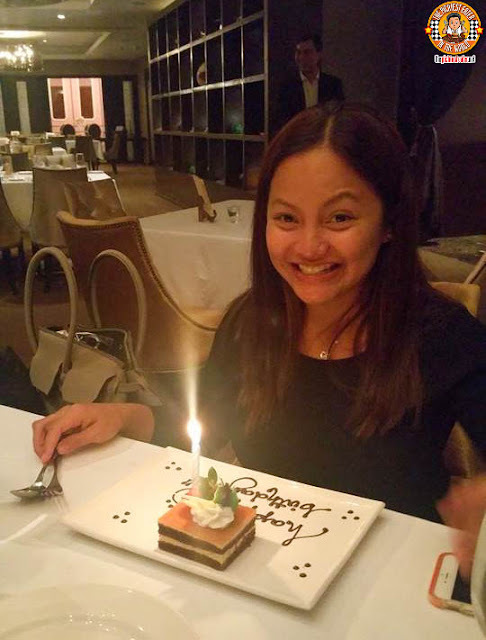 It took a couple of seconds for us to realize that the Oakwood Staff, led by Aleah, had planned a simple surprise for Rina's Birthday! Although Aleah didn't do the chair dance for us like I had hoped, her team's rendition of Happy Birthday was an acceptable alternative! One glaring thing I noticed about the Friday Night Classics, is the price point. Given that Oakwood is a prestigious hotel and the quality of their steaks is nothing to scoff at, the prices are not as astronomical as one would think. 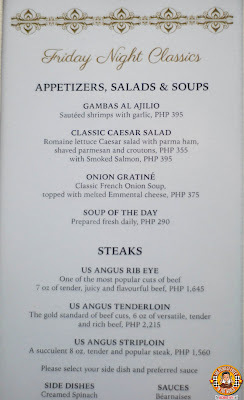 I wouldn't think twice to pay P1,645 for that gorgeous Rib Eye Steak. With the romantic ambiance and reasonable prices, the Friday Night Classics at Nostalgia Lounge is a nice way of impressing a date, or spending quality time with a loved one. Much thanks to Aleah and Janine for an amazing dinner!